The history of Soursop spans back to 1526, when it was one of the first fruit trees carried from the North American continent across the Pacific to southeastern China, and Australia. It was also brought to the western shores of Africa. Soursop was noted by Spanish historian Gonzalo Fernandez de Oviedo y Valdes in 1526 as a plentiful fruit. And, soursop has been grown in Florida for over a century. It was listed by the American Pomological Society as a Florida fruit in 1879. You can sometimes find it in home gardens. 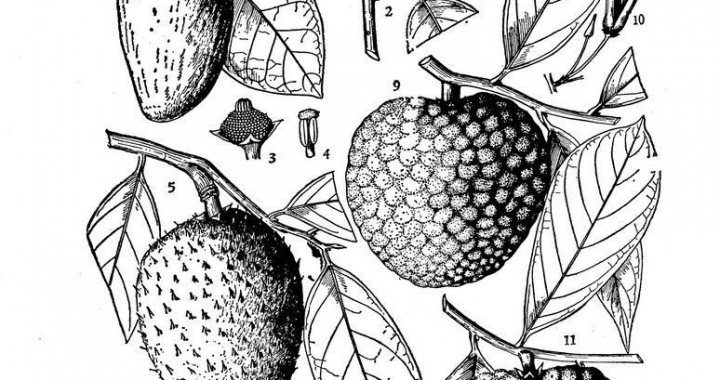 Cuban soursop began selling to Key West, Fla., in 1887 for 10 cents to 50 cents each. The soursop fruit is not quite as big as the enormous jackfruit, but still it is hefty. It measures four to 12 inches wide and as much as six inches long. A single fruit may weigh up to 15 pounds. The tree it grows on can reach to 30 feet in height. Found in tropical and subtropical climates, it is usually oval or heart-shaped and can be strangely curved. It can grow oddly thanks to issues with insects during growth. Soursop has a spiny skin that’s not edible and is dark green until mature when it becomes yellowish green in color. It has a the same type of scent and flavor to the pineapple but it has a bit of a lingering musky flavor as well. The pulp is an off-white color. It is also granular fibrous and very juicy. It grows in segments where there is an oval, smooth, hard, black seed, about 1/2 to 3/4 inch long containing anywhere from a few dozen to 200 or more seeds. The island of Grenada produces particularly large and perfect soursop fruit. Exporters regularly deliver them by boat to the market of Port-of Spain because of a shortage in Trinidad. In Colombia, where the soursop is generally large, well-formed and of high quality, this is one of the 14 tropical fruits recommended by the Instituto Latinoamericano de Mercadeo Agricola for large-scale planting and marketing. Soursop is one of the 14 tropical fruits that the Instituto Latinoamericano de Mercadeo Agricola noted as having strong demand for large-scale planting and marketing. Soursop is also produced throughout Venezuela, which provides the supply for the processing plants where the frozen concentrate is manufactured. Strained pulp is also produced commercially in Costa Rica.